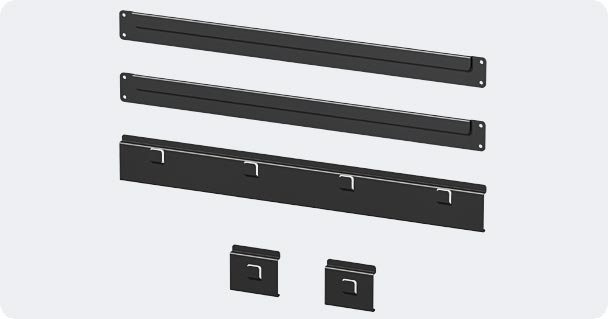 Per Kit Includes: (2) 30"W satin powder coat black j-tracks, (4) 2"W satin powder coat black Z-brackets, (9) black wood screws, instructions. Use on regular flat walls such as drywall, studs, concrete, cinder block, etc. 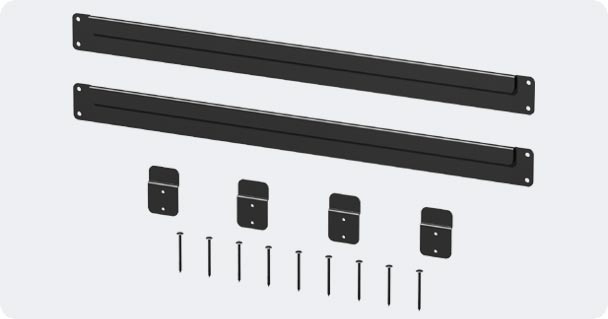 Per Kit: Includes: (2) 30"W satin powder coat black j-tracks, (2) 30"W satin powder coat black channel mount tracks, (9) black wood screws, instructions. Use to mount cabinets on slatwall panels such as our storeWALL Heavy Duty product line. Do Not mount this product on lightweight/flimsy slatwall!!! You Will Receive The Proper Number of Kits as Shown Above To Mount All Your Cabinets With This Package Per Your Mounting Option Selection. Regular Flat Wall And Slatwall Mount Options Will Not Contain Any Floor Platforms. Click on the picture or link below for additional product details.